I just started reviewing from a company U- Spicy. I am a huge make up junkie, Yes, as you can tell from my blog I do a lot product reviews and post freebies that don’t require reviews. When they asked me to review these I thought they were going to be typical brushes that you get with sets like the make up train case kind. But, NO!!. These have to be the best I have tried since the Bare Mineral brushes. 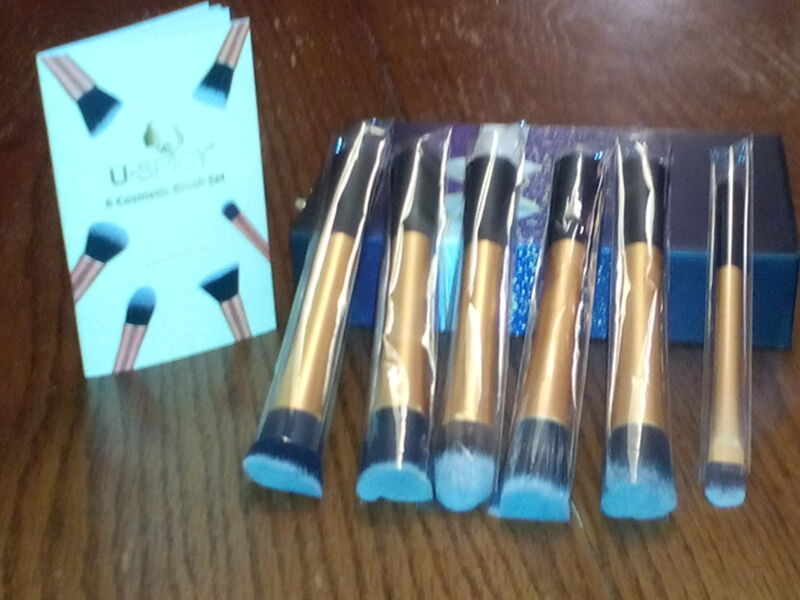 This set came with 6 brushes, different sizes for the occasion you need for the make up you use. The glide so nicely and not rough like typical ones. Also, what I like about them is that they are easy to wash off and doesn’t leave the make up left over. This brush kit comes in a elegant box which looks perfect for a gift giver. There is also a nice little booklet that comes with it. Brush 1. This is the flat head brush(2) which is used for foundation, its ideal for liquid or powder foundation, as well as applying other powder products. Brush 2. This is the rounded brush, its used for a bronzer. it has a domed tip that can reach contoured places, that hard to reach places that a flat head brush can’t reach. Brush 3.Tapered Brush This brush is perfect to paint into the creases and to define the shape of your eyes. But, you can apply powder ,liquid or any other powder make up with it , but I feel this is more for the eyes. Brush 4. Angled Flat Brush is made with high quality materials. Its angled flat area is expertly designed to buff powder onto your skin, especially around the cheeks. Brush 5. Paddle Shaped Brush this has a extended handle and is really easy to use. its ideal for powder,foundation, eyeshadow creme.for a picture perfect result. How to clean the Brushes is really simple, you can use a make up brush cleaner or a gentle shampoo, which baby shampoo is the best way to clean your brushes. Run the brushes (bristles) under lukewarm water first and then use the gentle cleaner. When cleaning or massaging make sure you do not press on the bristles. After cleaning the brushes use a tissue or cosmetic cotton to lightly press on the bristles DO NOT TWIST THE BRISTLES!!!!. To fully dry the brush, lay the brushes on a dry towel and wait for all the moisture to be released from the brushes. Let it dry natually , do not use a hair dryer or put in direct sunlight to dry them. That would ruin the brushes all together. I love these again and glad to review them for Free, in exchange for this review.